Whether you actually hurt yourself or just suffer from a bruised ego, slipping and falling is always a nasty shock. At home, you can usually just dust yourself off and forget about it, but if you own a business, slips and falls suddenly become much more serious. Maintaining a safe business property for your employees and customers becomes paramount, both to give them a great experience, and to prevent any big insurance claims from knocking at your door. Stay up to date with your city’s local building codes, and install the proper handrails along every stairway and ramp. Even tiny platforms comprised of 1 or 2 steps should have some kind of banister in place. This gives stability to your pedestrians and helps protect you if someone falls in those areas and decides to pursue legal action against you. Also consider lining your stairs and ramps with a non-slip material. Remove obstructions from any walking paths that your employees or customers have to use. It is also important to repair uneven, broken, or bumpy surfaces in the parking lot or on the sidewalk. In the winter, make sure your sprinkler systems are turned off and drained to prevent leaks and icy patches around your establishment. Aside from covering the basics to keep your business up to code, just make it a habit to look for potential slipping/falling hazards located all around your business. Maintain adequate lighting in all areas where pedestrians will be walking. Keep “Wet Floor” signs in areas where your employees can conveniently access them to warn people away from spills. Repair torn carpet, loose or missing floor tiles, and other flooring materials as soon as you can after they are damaged. If you live in an area with heavy snowfall, establish a snow removal plan for parking lots, sidewalks, and dumpster areas. Keep emergency phone numbers posted in areas where people can see them easily. Stay stocked up on first-aid kits and keep them in plain site. 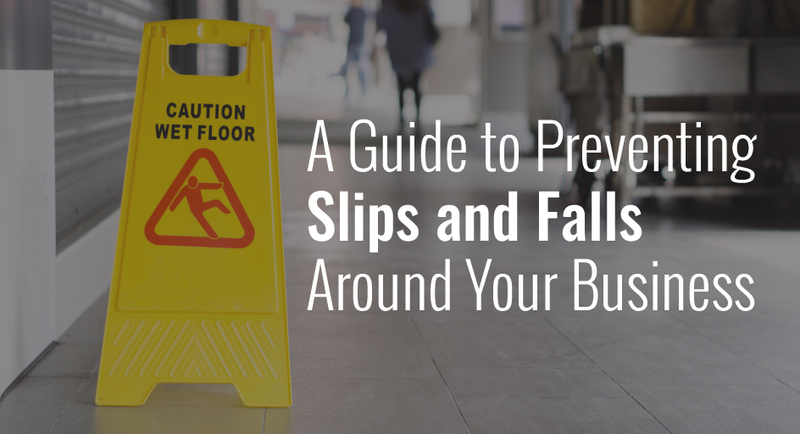 These emergency resources help you and your staff minimize the damage of a bad fall. When an employee or a customer takes a fall at your business, the consequences have the potential to be dire. Prevent them as much as you can by keeping the area clean and maintained. People will be safer and your business will look better for your efforts! Overall, make sure you are protected by a solid insurance policy that will cover your company if someone gets hurt anyway. You can never be too secure!